A bit of progress on the growing front. Other than the parsnips, all of the other seeds I had planted a fortnight ago are up facing the sunlight. Some I admit are a little leggy which are concerning me a little, that they may be too weak to continue and may keel over. I will have to keep an eye on them. I planted some more seeds today including blauhilde, neckar gold, blue lake all a variety of climbing beans, Igloo cauliflower and greyhound cabbage (see side-bar for full list). Sowing the seeds today felt a bit peculiar. Let me tell you why? In the past, I took for granted the space I had and would sow trays full of seeds of a particular variety. This time knowing that I had limited space to grow, I sowed what was realistic for the space I had, so thats about five seeds of each of the climbing beans and 6 cabbages for example. Although the sun shined and enticed us to put out our laundry out on the washing line, it didn't last before it made us rush back out and pull them all off. But before that, I was able to have a look at some progress in the garden. 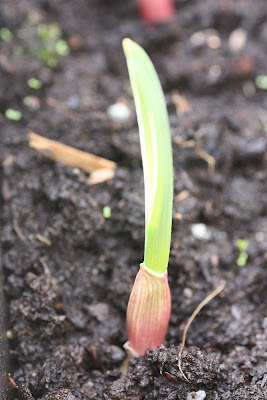 For a start the garlic I planted a fortnight ago is up - this one looks particularly luminescent. The herbs especially the chives are starting to thicken. I'll have to tidy it up before it becomes too unruly. I also planted out directly some Ideal baby carrots in a pot; and Bright lights radishes in the 3 foot by 3 foot plot. 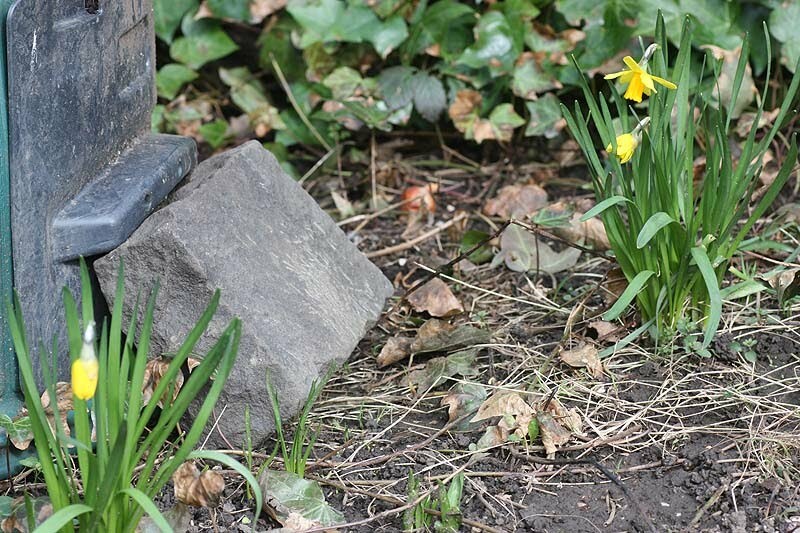 The first of my daffodils are up in the garden too. Its nice to see a little colour in the garden. Ohhh, the daffodils are beautiful!! As is the garlic - it looks so strong and cheerful! Lovely daffs! They've been quite late coming up this year, haven't they. Couldn't find any for st david's day. Pretty! Isn't it lovely to see the first of the spring color? We're about a month into good weather now here in the Pacific Northwest and I'm loving spending every non raining moment I can in the garden. Enjoy! Your little shoots look wonderful peeking up through the soil...Such a lovely sign of spring! 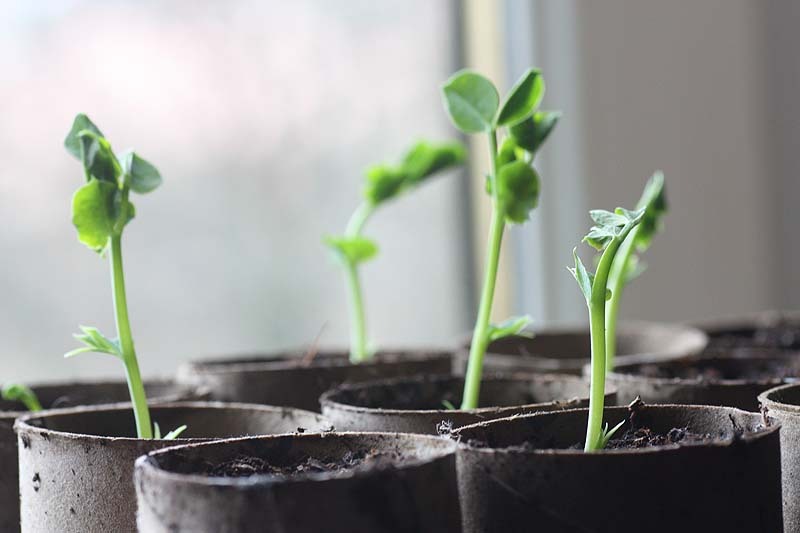 According to Gardener's World which we watched on iplayer last night, if you blow gently on leggy seedlings it strengthens the roots and bushes them out a bit - worth a try? 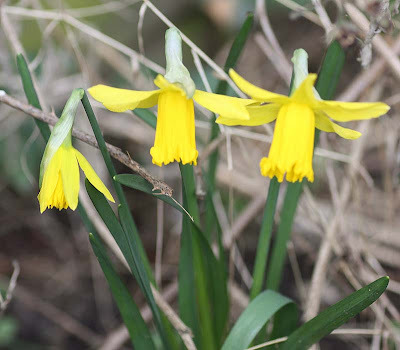 Lovely daffs. I do hope the garlic grows well. I did plant it late, plus this year it'll be growing in pots. Lets see how it works out. Yes Christi. I agree. It is pretty and lovely to see the first of the spring color, esp in your own backgarden. Lucky you to be getting good weather! Thanks for that good advice. I will def. try it. The daffs are late this year. By a month I've been told. I didn't have any of my own for St Davids day this year either and got them from the florist. Getting the hang of how many seeds to start has always been difficult for me. It sounds like you're well underway to a wonderful vegetable garden. I'm looking forward to seeing/hearing about all the different beans you've got going. The daffs are pretty too. Consider a different yellow flower that tolerates the heat. I agree Nic. Shame the weather turning again though. The way you are sowing sounds like how i do it as well. For although I have a bigger garden, i try to cram so much variety in that i have then be sensible about the amout of seeds i sow too. I assume all those outdoor updates are now under snow right? This way of sowng is new to me. I will try and cram in what I can for sure. Re: the snow - its actually turned out okay in the West of Scotland, its the East coast thats getting a hammering, where i was early this week. So glad I made it safely back home, the weather really was horrendous in Berwick upon Tweed. Glad to hear the bad weather didn't affect you at home. Thank you SO much Kella. Thanks for coming by. I will advise to the best of my knowledge and experience. I don't do very much with my herbs and just leave them to fend for themselves esp as they are contained in a plot, especially the chives which are hardy. If they are in pots I shove them into a corner to shelter them from the weather. The only herb I was precious about was my lemon verbena, that I would bring indoors.